The Opti-Com® multi-duct conduit system gets your new fiber optic cable on-line quicker and more economically than conventional 4″ duct and pulled-in reeled inner duct. The Opti-Com® factory-installed inner ducts remain straight, eliminating the additional surface contact created in the twisting of reeled inner ducts. This reduces the number of manholes required for cable pulling set up points by increasing the spacing distance resulting in lower installation costs. Opti-Com® is available with 3 inner ducts each with inside diameters of 1.50″ or 4 inner ducts each with inside diameters of 1.25″, an option not available in conventional installations. 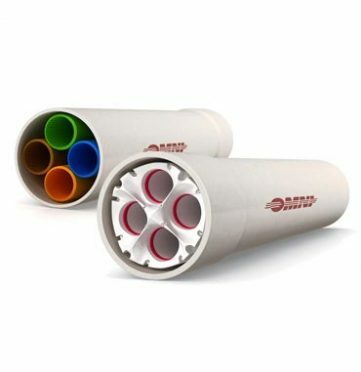 PVC Opti-Com® multi-duct conduit comes in 20-foot lengths. Each 20-foot length is manufactured with a 6-inch integral bell end on one end and matching inner and outer duct spigots on the other end. Standard PVC outer duct color is white for Type C and gray for S-40 and S-80. Custom print line and/or custom outer and inner duct colors are available upon request. The OMNI-Bore® Opti-Com® multi-duct is manufactured in 20-foot lengths with a 6-inch integral bell on one end and spigot on the opposite end. Standard PVC outer duct color is gray. Specific inner duct colors are available upon request.